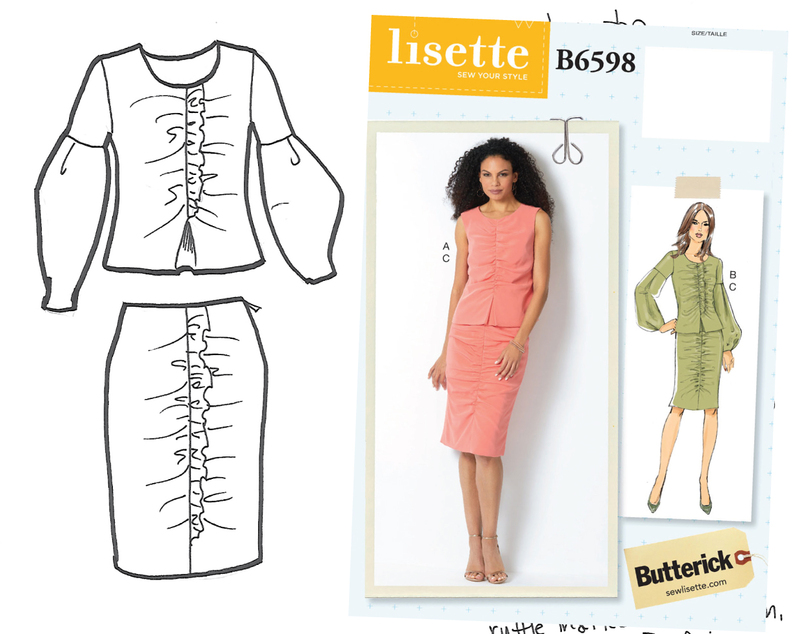 Remember, months ago, when I mentioned I was working on the Lisette for Butterick B6598 skirt? Yeah. I cut it out and then dove back into the spring patterns with absolutely no time for personal sewing. So it was only recently, once the patterns had finally gone to the printer, that I had time to sit down and sew it. Here it is, at (very) long last. I used a plaid wool and am so pleased that I did. I also took the little ruffle from the front blouse, lengthened it, and sandwiched it into the front seam, just like my original sketch. We had removed that ruffle from the pattern because it felt like too much, especially when it was also part of the top. But without the top, I’m all for the extra! Here’s my original sketch, shown with the final pattern cover. The skirt looks quite different when sewn in a more menswear-style fabric, doesn’t it? The fabric really tones down and balances out the feminine ruching. Other than the ruffle, I made no other changes to the pattern. And yes, I can wear it without the belt, but when you’ve got this much going on already sometimes a little more is even better! Can we just take a second to appreciate the back seam with the invisible zipper? I got lucky and didn’t have to fiddle with it a bit. It doesn’t always happen like that, believe me. As a frequent wearer of pencil skirts, this feels like a fun twist on what, for me, is a wardrobe essential. I’ve had lots of fun wearing it! Have you tried this pattern yet? You can purchase it right here if you haven’t already. I think it would be cute in linen, crepe, or tropical wool for spring and summer, too. You have sold me on this pattern with your version. The fabric you are using is so much better than the pattern cover. Love the ruffle- nice quirky detail!